This picture is from Liam Lynch of the Kiwanis Kavaliers. This is a picture of a few members of Kiwanis Kavaliers on a free day in New Orleans. Around the table from left to right is me (mellophone/horn sergeant), Ryan (drum major), Daniel (tuba/low brass section leader), Devin (tumpet), Neil (baritone), Jenn (baritone) and Heather (mellophone). 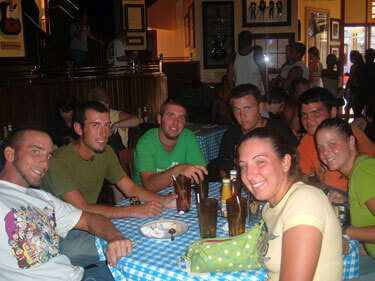 This picture was taken after we finished our lovely meal at the Hard Rock in New Orleans. My thoughts are still with all those people there, and I hope that with all the help coming in, the city can rebuild quickly. I can't wait to go back this summer.